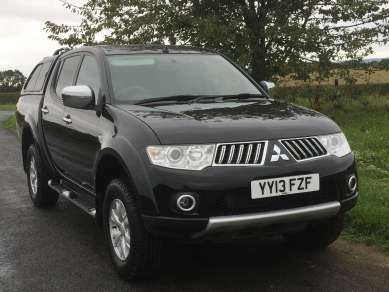 JULY 2013 MITSUBISHI L200 2.5 Did TROJAN 4X4 DOUBLECAB PICKUP, 1 OWNER, BLACK, 46,8500 MILES, CLOTH TRIM, REMOTE CENTRAL LOCKING, AIR/CON, E/M, E/W, RADIO/Cd, FRONT FOGS, RUNNING BOARDS, ALLOY WHEELS with Wrangler 245/70R16 Tyres, Canopy, Load Liner & Towbar. SERVICE HISTORY. MOT 30th JULY 2019.